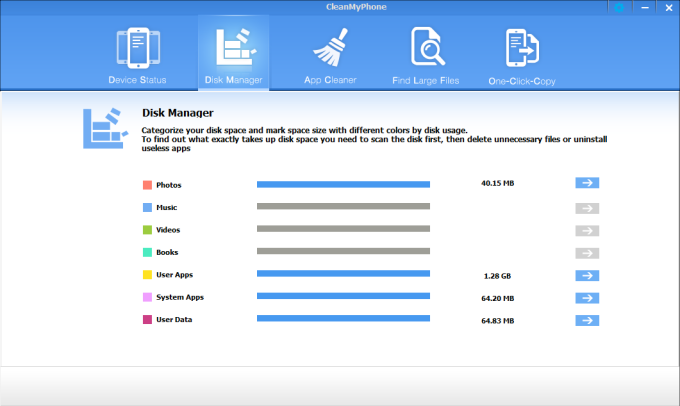 CleanMyPhone is a definite must-have solution for any iOS device user who wants to have more free space and keep his iPhone, iPad or iPod touch clean and running smoothly. CleanMyPhone helps to configure, organize and manage files & apps on your iOS device, it reclaims storage space and keep your iDevice running smoothly. What's more, the program will quickly find out and clean up large files on the disk space. With it's One-Click-Copy, you can backup the vital data on your iPhone, iPad or iPod easily. Find My Phone status not syncing.. Just installed and it keeps asking me to de-activate &quot;Find My Iphone&quot; before it can clear any data. I have turned this feature off three times and re-started the phone and the program and still having no luck. Awful Product, Awful Service. . I purchased the product to clean my new iPhone 6 of excess documents &amp; data, image files in old iMessages, etc. The program crashed every time I tried to use it, the company charged me for it TWICE, and they are not responding to any of my emails. The works program and service ever. What do you think about iPhone Cleaner for PC? Do you recommend it? Why?